Älmhult is a place filled with creatives from all over the world and I love it,’ says Karin Gustavsson, range manager and creative leader at IKEA. Even with all that diverse talent inside of it, the small town in which IKEA was founded is anything but a sealed box. ‘We’ve always wanted to reach out to curious people around us. That’s why we started to collaborate – to work with people who open our eyes, ask questions we hadn’t thought of and force us to move forwards.’ Working with ‘celebrity’ designers isn’t interesting in itself, it’s a learning process,’ adds Karin, who recently led the OMEDELBAR collection with fashion activist Bea Åkerlund, and today working with a new collection together with Martin Bergström. ‘It was quite a shift going from bold fashion with Bea to being so raw and honest with Martin, but I like the stretch of the collections. It’s how you attract lots of people.’ So what could designers like Bea Åkerlund, Virgil Abloh, Ben Gorham and Martin Bergström gain from working with IKEA? ‘Designs under their name are often unique at high quality and in small volumes,’ says Karin. ‘Collaborating with IKEA is an opportunity to make products in bigger series – that way they become very affordable.’ And what did IKEA gaining from working with well-known designers? ‘By working with them, IKEA can challenge the prejudices between “high” and “low”. It keeps us alert and unexpected. Karin is responsible Creative Leader for various collections, recently OMEDELBAR, a collection developed together with Bea Åkerlund and INDUSTRIELL a collection developed together with Dutch designer Piet Hein Eek. SVÄRTAN was another collection created as a collaboration with Martin Bergström all in black notes therefore the name that means “blackness”. Karin started with IKEA in 1990 as Interior Designer with a background in textiles and arts as well as an exam in economy. She believe that the combination of fashion and business is key for success. During some years Karin was based from Milan working as Creative Director later she was hired at Orrefors crystal factory in Sweden as responsible Product Manager. In 2005 Karin happily joined IKEA again and has since then been working with range development and various projects such as collection collaborations. Karin believes that collaborations together with unexpected designers, such as Virgil Abloh, is meant to offer a provocative viewpoint on how young people consider design and art at home. She want to create unique, innovative and inspiring furnishings so that young people can live with design and art, even with a small budget. It is a bubbly and boisterous place, the creative mind of Martin Bergström. Originally, and still, a fashion designer, his ingenuity is also applied to such diverse fields as stage outfits, interior design, prints and set design - using everything from fruits, decomposing fabrics, ink stains and forgotten handicraft techniques to bring his compositons alive. But it´s the hand-drawn patterns that are the basis for everything. Whether creating a unique textile print for a major Parisian couture house, costumes for a contemporary dance troupe or clothes for his one-of-a-kind collections, it all begins with the drawing. Working with both digital print and screen print, the groundwork is nevertheless all made by hand. Educated at Konstfack University College of Arts Crafts and Design in Stockholm and Universität der Kunste in Berlin – he graduated with an M.A. 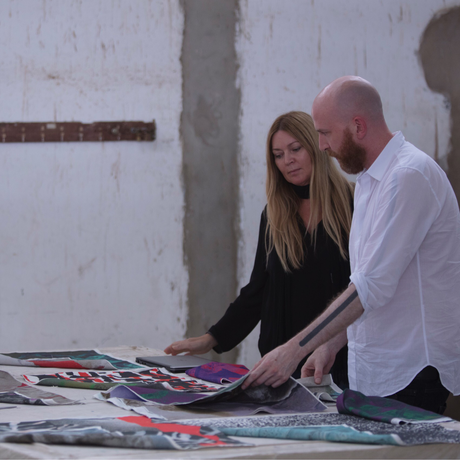 in Textiles in 2005 – Bergström has an artistic outlook when it comes to fashion and design. This is true whether he´s producing made-to-order garments or collaborating on one-off projects with globe-spanning companies. Organic shapes meet abstraction, playfulness merge with couture-like sewing techniques, futuristic shapes are found in the old, rotting potato found in the fridge. In the work of Martin Bergström, restraint and artistic freedom create a dramatic tension, and despite the kaleidoscopic quality of Bergström´s prints, there´s a feeling of something held-back and controlled. This is partly due to a careful selection process in which the free-flowing creativity is edited and reworked. While prints and patterns are the main focus, the clothes are still important, and Bergström regards the collections as a kind of exhibition - the garments themselves being his ‘paintings’ and the textiles his 'paint’. In this manner he has managed to find a place in a industry which he is critical of, questioning the throw-away culture of modern fast fashion. But Bergström also believes in working within the system, and it´s important for him that his designs - whether they are made for a luxury company or aimed at the mass market - have lasting value and meaning.